MOON TOWNSHIP — This weekend, the Robert Morris women’s basketball team (9-8, 6-0 NEC) looks to stay undefeated in Northeast Conference play as they host Wagner (5-12, 3-3 NEC) on Saturday and Sacred Heart (10-7, 6-0 NEC) on Monday. Over their past six conference games, the Colonials have been on a tear, winning all six. In fact, the last time the Colonials lost a game this season was on December 30, a 59-36 home loss to James Madison (13-4, 5-1 CAA). 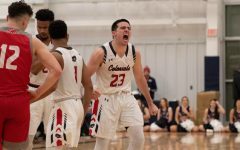 The last time the Colonials lost a regular season conference game was February 12 of 2018, when they lost 49-47 to St. Francis Brooklyn. 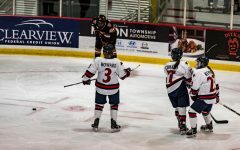 In the Colonials last game, they played against the Central Connecticut State Blue Devils (4-12, 1-5 NEC) in New Britain, Connecticut. Robert Morris won the game 64-57 thanks to 19 points by Honoka Ikematsu and 12 points by junior Nneka Ezeigbo. Before their last game against Sacred Heart, the Seahawks were starting to go on a bit of a roll, beating Fairleigh Dickinson (5-12, 2-4 NEC) by a score of 71-59, and then thrashing Mount St. Mary’s (8-9, 2-4 NEC) to the tune of a 26 point victory, 92-76. However, Wagner’s hopes were crushed as they faced Sacred Heart last Monday. While the Seahawks played tough, they lost the game 72-64 to the Pioneers. In that game, the Seahawks were led by English sophomore Kaleah Edwards, who had 19 points and seven rebounds in the loss. Taylah Simmons and Alayshia Dailey were both in the double digits as well with 14 and 10 points scored, respectively. Similar to the Colonials, the Pioneers of Sacred Heart have started NEC play strong, going 6-0 as well. The Pioneers last loss was a 71-43 away loss to No. 15 Kentucky (16-3, 3-2 SEC). Sacred Heart last played in the aforementioned Wagner game, winning 72-64. Candice Leatherwood led the Pioneers in scoring with 20 points while graduate forward Katherine Haines was close behind with 19, including 8-14 from the field. Nneka Ezeigbo (RMU): Ezeigbo, a junior from Ewing, New Jersey, leads the Colonials in points per game not only in NEC play (11.3) but overall as well (10.1). Ezeigbo is also dominating on the boards, averaging 6.6 rebounds a game, good for sixth in the NEC. 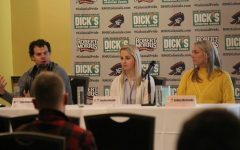 Isabella Posset (RMU): Posset, only a freshman, has been one of the leading passers on the Colonials. Her 2.9 assists per game are tied for seventh in the NEC. Taylah Simmons (Wagner): Simmons is the leading scorer for a very young Wagner team that has just one senior on the roster. The 6’0” guard is currently averaging 13.2 points per game total and an astonishing 18.2 during Northeast Conference play. Katherine Haines (SHU): As the NEC player of the week for two weeks counting now, Haines has proven that she certainly belongs there. The 6’2” forward who hails from Ridgemont Park, New Jersey is averaging 16.4 points per game, which is sixth in the NEC and 120th in the NCAA. This weekend, the Colonials will do what is necessary to stay undefeated in conference play. The Colonials will beat Wagner handily, 85-67, with Isabella Posset earning her first collegiate double-double with 10 points and 11 assists. For the second game against Sacred Heart, it will be a tight affair, with neither team wanting to lose their first conference game. This game will go into overtime with the Colonials edging out the Pioneers 78-74. 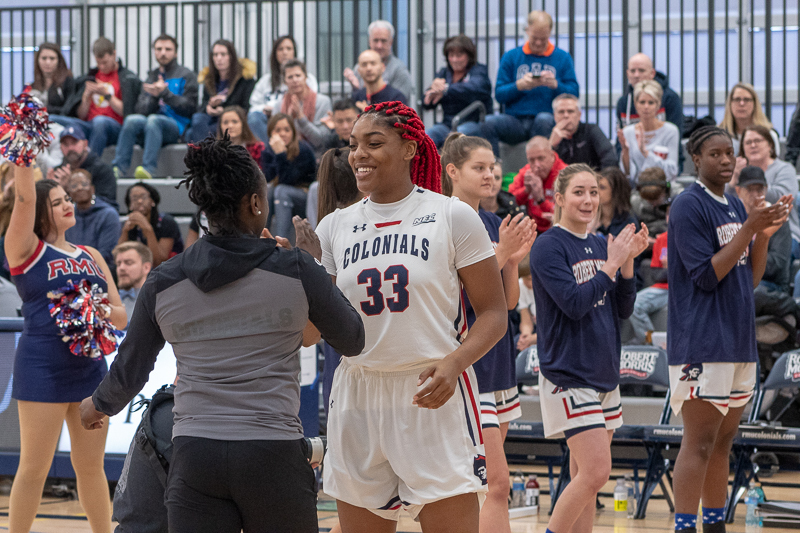 Nneka Ezeigbo has 17 points in the game, while the Colonials defense stifles Katherine Haines, who will have less than 10 points in the contest.